The $140 million Detroit streetcar is among few in the nation operated by a nonprofit. It was primarily funded by private and philanthropic contributions and is intended to spur economic development along its 3.3 mile route along Woodward from Midtown to downtown. 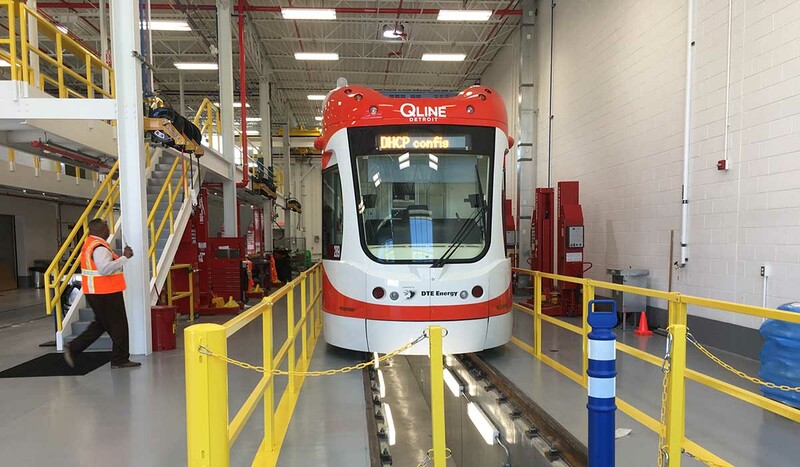 The QLINE is billed as the only streetcar in the nation to operate on battery power for 60 percent of its route. It gets charged at the headquarters, at each station stop and when it connects to the overhead wires. These riders who got a preview ride on the streetcar on May 1 got stuck on board for about 15 minutes when a traffic signal malfunctioned. 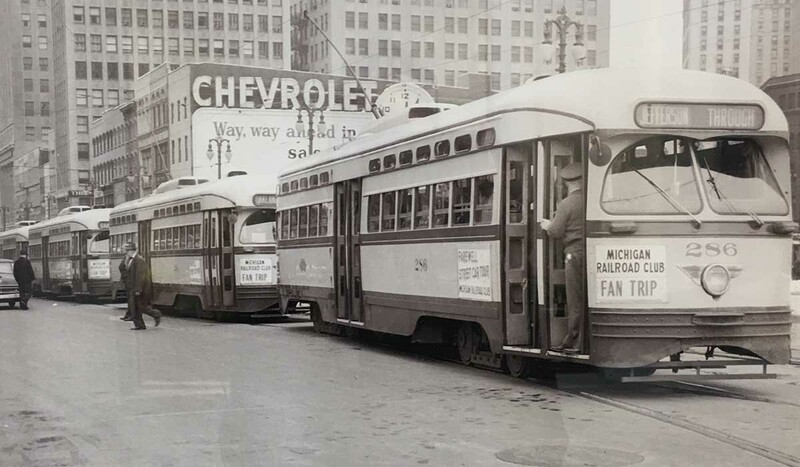 The QLine isn't the first streetcar to rumble down Woodward Ave.
Last week, during a trial run for a group of 20 curious commuters, Detroit’s first streetcar in more than 60 years got off to an inauspicious start. 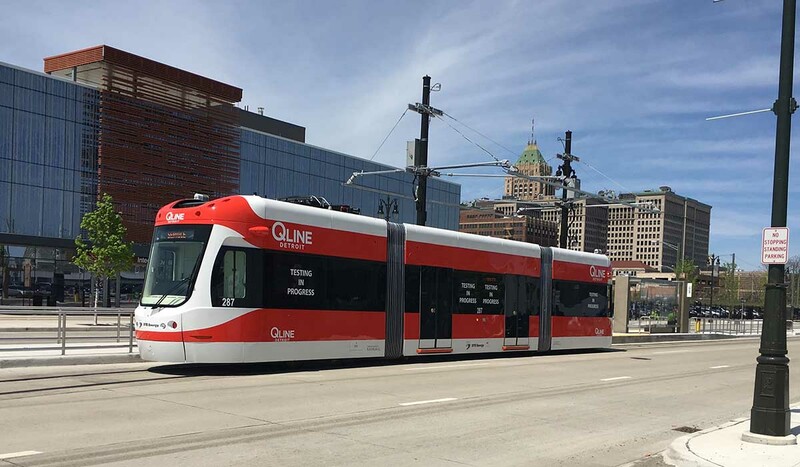 One minute the crowd of community activists and workers were oohing and ahhing as the shiny red streetcar, officially named the QLINE for sponsor Quicken Loans, glided down the tracks of Woodward Avenue. The next, the preview ride ground to a halt. The streetcar’s traffic signal malfunctioned, marooning it on the other end of Woodward. It would take another 15 minutes for the QLINE to move. Boosters hope for a smoother start Friday, when the streetcar officially begins operations. That’s because so much is riding on its success. Privately owned and financed – at least for now – the streetcar’s fate could help decide the future of mass transit in southeast Michigan. Generally regarded as having the worst transit system in America, Detroit has seen dozens of plans come and go to improve regional public transportation since the last streetcar ambled down Woodward in 1956. The latest plan was November, when voters narrowly rejected a regional tax to create a system that would begin with bus rapid transit and eventually routes to Detroit Metropolitan Airport and commuter rail from Detroit to Ann Arbor. The next chance for regional transit advocates to get a millage on the ballot will be 2018. “Everybody knows the stakes,” said Dan Lijana, a spokesman for the M-1 RAIL, the nonprofit that operates the streetcar. Several experts told Bridge Magazine the the streetcar will only succeed if it becomes more than a $140 million tourist tram or designated driver for hipsters and sports fans along its 3.3 mile route from Midtown to downtown. 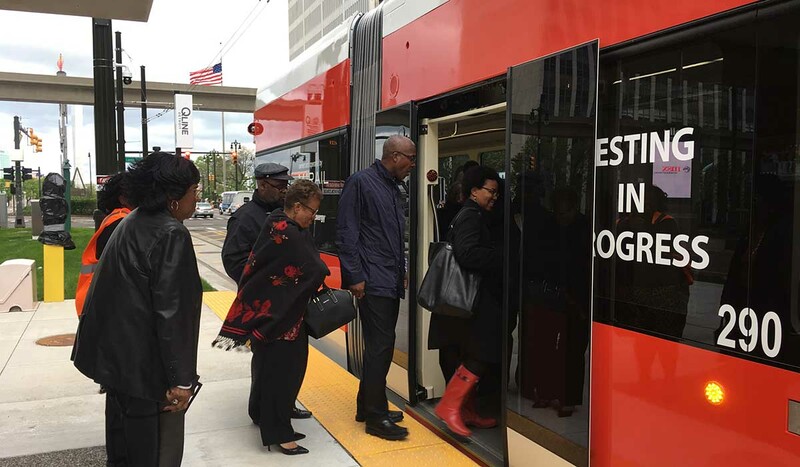 To meet its lofty ridership goals, Detroit’s new streetcar must help commuters to not only get to work and class but seamlessly connect to other transportation options. The QLINE, which charges $1.50 for a three-hour ride, needs to hit goals of 5,000 to 8,000 passengers per day to break even. That would make it the second-busiest streetcar in America, and the M-1 RAIL is collecting private donations for a reserve fund to subsidize operations until 2027. So far, it has enough until 2022 (overall it has raised about $182 million in donations and federal grants, including $140 million in startup costs). Studies and data on streetcars in 16 other cities across the country – including Washington, DC, Tampa and Seattle – show that reaching 5,000 daily trips is no easy feat. Jeffrey Brown, a researcher with the federally-funded Mineta Transportation Institute based at San Jose State University, was upbeat about the QLINE’s aspirations, but skeptical that a streetcar that’s not an extension of other transit could gain such a high ridership. “They need to think about what’s going to attract regular riders, not just riders who will ride it once because it’s the cool new thing in town,” said Brown, who led a 2015 study of streetcar systems in five cities including one in Portland, Oregon, that averages 16,000 rides per day on a 7.3-mile route. “It needs to be convenient to (riders) in some way and get them to a place they need to get to,” Brown said. On a recent Wednesday, M-1 RAIL spokespersons Lijana and Sommer Woods sat in a sparsely furnished conference room and explained how the system would meet its goals. As they spoke, one of the vehicles charged silently in the cavernous garage on the other side of a door. The QLINE intends to initially serve a similar downtown market as the Detroit People Mover – visitors, local workers and pleasure seekers. The People Mover averages 5,493 trips per weekday and 8,611 on Saturdays, according to the Detroit Transportation Corp. that operates it. Anyone who has ever been on the People Mover on a weekday, though, knows there aren’t 5,000 riders on the elevated train on a typical Tuesday. Built in 1987, the train that makes a three-mile loop around downtown has its averages boosted by special events, such as the North American International Auto Show that drew nearly 20,000 riders per day over 14 days this year. The thinking behind the QLINE ridership projections is simple: If the People Mover can do it, so can the streetcar. Its organizers expect ridership to come from tourists, new residents and workers flocking to the area because of its booming economic development. Running through Midtown, the streetcar will travel along an area that’s seen $7 billion investments since 2013 and has some of the highest incomes in the city, in several cases double Detroit’s mean household income of $37,570. The narrow, half-mile strip that straddles its tracks accounts for only 2 percent of the city, but 45 percent of all residential and commercial construction since 2013, Detroit building permit data show. Concert halls and arenas along the route have more than 200 events per year. So there’s little doubt the streetcar will be full of bar-hopping hipsters and fans of Detroit’s four sports teams. But will it serve commuters’ needs? More on that later, M-1 RAIL officials said. Details such as transfer agreements are still being hashed out, as are passes for workers who use private shuttles to get from parking to work. The challenge is, no other streetcar in America that was built to spur economic development has met such a high ridership mark, Brown said. Over the last 20 years, the cars have seen a resurgence due in part to federal grants that were more readily available for streetcars than light rail. At the top of the charts is Portland, which has 76 stations across the downtown, hospital and college areas where many of the city’s jobs are located. But Portland’s streetcar is far different from Detroit’s because it’s a part of a robust transit system that includes light rail and busing as well as the streetcar. Portland also is the only city where streetcar usage surpasses that of local buses Brown and his Mineta researcher colleagues found. The nation’s second-busiest system, the streetcar in Kansas City, has the kind of ridership Detroit hopes to achieve: Daily averages of 6,365 rides. But it has a huge advantage over the QLINE. It’s paid for by tax dollars and is free to ride. M-1 RAIL officials may need to reassess goals and plans, Brown said. “They need to ask themselves how realistic it is that they’re going to get all those tourists. No other city has done that,” he said. M-1 RAIL officials said they understand the streetcar needs to serve daily commuters who live both inside and outside the rapidly growing Midtown neighborhood. That’s part of the reason the tracks were built to go north of the Amtrak station, past a few blocks of undeveloped abandonment and to the southern border of the Northend neighborhood. Input from Northend neighbors, many who are long-time residents, influenced decisions to run the streetcar off wire in some areas to not obstruct the historic feel, Woods said. “It’s for everybody,” Woods, vice president of external relations for M-1 RAIL, said of the streetcar. She said the QLINE hopes to attract riders because its tracks are near some of the busiest city and suburban bus routes. The city’s Woodward Avenue bus, for instance, has about 8,300 riders per day. Megan Owens, executive director of Transportation Riders United advocacy group, said she hopes the streetcar makes Midtown a modern, “20-minute neighborhood” where transit puts people within a short walk to work, entertainment and services. But she warned against overstating the importance of the streetcar to the future of regional transit. “We have to accept what it is and what it isn’t going to be. I’m not necessarily expecting enormous ridership. It’s going to be modern, but it’s not going to be rapid. It’s going to be stuck in regular traffic,” Owens said. Another challenge: The streetcar is privately owned and not supported by taxes. So in 10 years, M-1 RAIL organizers hope a group such as the Regional Transit Authority (RTA) takes over operations. Tiffany Gunter, interim CEO of the RTA, said the plan hasn’t changed even though the regional tax plan failed and the RTA now faces a deficit. In the meantime, the QLINE hopes to increase ridership by tapping into the sizeable market of workers and Wayne State University staff and students who park near the route. Currently, several employers such as Wayne State, Quicken and the Detroit Medical Center shuttle thousands of their employees and students around Midtown from parking lots to work and class. Transit officials are in talks with employers hoping to develop a fare pass that will incentivize workers to park and use the streetcar to get to their destinations. Wayne State shuttles about 2,800 staff and students around the campus. The university has 13,000 parking spots across eight parking structures and 44 surface lots — all within walking distance of the streetcar, and officials hope to provide all students and employees with free or discounted transit passes, officials said. Back on the stalled streetcar, the vibe was positive even though the 45-minute ride stretched past an hour. It was filled with members of a safety and security advisory committee who assisted the M-1 RAIL with planning such as Elise Fields, 30, of Grosse Pointe. She visits the downtown area for entertainment and expects to ride the streetcar frequently. Also on board was Pam Malone who lives about a mile north of the streetcar and was not concerned about the test run’s malfunction. “I’m excited about the possibilities,” she said. Lots of interesting information but missing a key item. What does it cost to ride it? Good article, just pointing out a typo in paragraph 3: "take another take another"
Thanks, sharp-eyed James. Fixed now. What about liability in these "public/private" ventures. No Governmental imunity? "The People Mover averages 5,493 trips per weekday and 8,611 on Saturdays, according to the Detroit Transportation Corp. that operates it. Anyone who has ever been on the People Mover on a weekday, though, knows there aren’t 5,000 riders on the elevated train on a typical Tuesday." How much of this tax will be used so Michael Ford can eat lobster a couple of days a week on the taxpayer dime? Will the RTA have a restricted fund set up for compensation to be deferred until he quits for a new job? How many times will he have to attend Mackinac Island conferences to learn how to run a SE Michigan bus system? If the board couldn't see that coming--or worse, they could, but hired him anyway--why should we give them our money? Why did you paste your comment from 2016???? To demonstrate it didn't take any particular expertise to recognize all the red flags in Michael Ford's history. The board either didn't see them, or ignored them. Neither inspires the kind of confidence that makes a diligent taxpayer want to voluntarily entrust them with additional revenue. Why did you use four interrogation points? Here in Cincinnati, the suburban anti-transit crowd has used the new streetcar as a reason to oppose any further investment in bus transit, regardless off the success or failure of the streetcar. A group of us rode it prior to the Wednesday/May 17th Tigers game (from Campus Martius to Comerica Park). It was a long wait -- which we expected -- but there was still "standing room only" when it arrived. Enjoyed the experience; however, several of us left the game early with the intent of riding up to Grand Blvd. and back down to Campus Martius. We waited 20 minutes and "still no car" -- the electronic map kept skipping from 3 to 22 minutes for "expected arrival" and showed movement of only one car on the southbound track. We finally "gave up" and walked back to our hotel. There was "no charge" for riding -- apparently through May 22? Obviously, they've still got some glitches to work out.